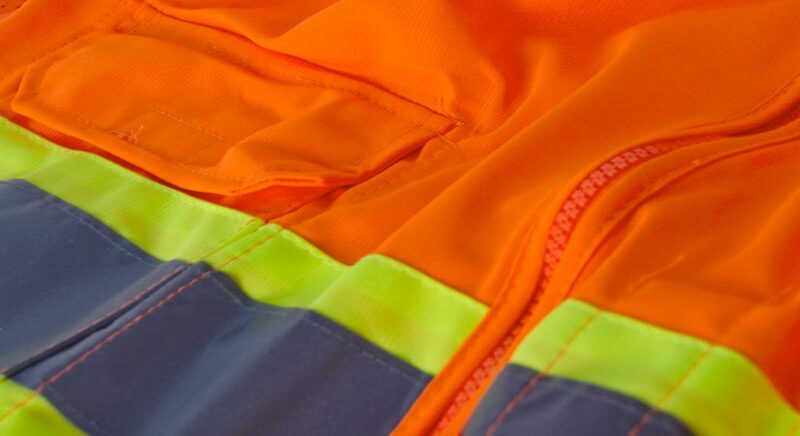 When Should High Visibility (Hi-Vis) Apparel be worn? For those who work in public areas or warehouses where motor vehicles are used, worker visibility is vital. In a fast-paced work environment, it is all too easy to lose track of where everyone is at any given time. When hearing protection is required there is the added risk of workers not hearing vehicles as they approach, greatly increasing the chances of a work-related accident that could result in serious injury or death. The simple solution to this potentially dangerous situation is the use of high visibility, or Hi-Vis clothing and apparel. ANSI/ISEA 107 is a voluntary set of guidelines that define the settings that require Hi-Vis gear and establishes 3 basic classes of garments based on the level of risk in the work environment: Class 1 or Type O (Off-Road), Class 2 or Type R (Roadway) and Class 3 or Type P (Public Safety). Class 1 (Type O) is defined as apparel that “provides daytime and nighttime visual conspicuity enhancement for workers in occupational environments which pose struck-by hazards from moving vehicles, equipment and machinery, but which will not include exposure to traffic on public access highway rights-of-way or roadway temporary traffic control (TTC) zones.” This class offers the minimum amount of high visibility materials to differentiate the wearer from non-complex work environments and is only appropriate for off-road environments. Examples of activities included in Class 1 include workers gathering shopping carts from parking areas, persons working in oil and gas extraction, refineries and mines and those exposed to the hazards of warehouse equipment traffic. Class 2 (Type R) represents the minimum level of protection for workers exposed to roadway rights-of-way and temporary traffic control (TTC) zones and is defined as apparel that “provides daytime and nighttime visual conspicuity enhancement for workers in occupational environments which include exposure to traffic (vehicles using the highway for purposes of travel) from public access highway rights-of-way, or roadway TTC zones or from work vehicles and construction equipment within a roadway TTC zone.” Roles included in Class 2 are roadway construction workers, school crossing guards, airport baggage handlers and ground crew, parking and/or toll gate personnel and tow truck operators. Class 3 (Type P) provides the most visibility to the wearer in complex backgrounds and through a full range of movement. This class includes garments that “provide daytime and nighttime visual conspicuity enhancement for emergency and incident responders and law enforcement personnel in occupational environments which include exposure to traffic (vehicles using the highway for purposes of travel) from public access highway rights-of-way, or roadway TTC zones, or from work vehicles and construction equipment within a roadway TTC zone or from equipment and vehicles within the activity area.” Occupations requiring Class 3 garments include road closure personnel, firefighters, emergency response workers, accident site investigators and law enforcement officers. Two more classifications of garments are listed for less dangerous settings. ANSI Class E garments do not meet the standards alone, but when worn with Class 2 or Class 3 garments they create a Class 3 ensemble. Enhanced visibility describes any garment of any color that has retro-reflective striping added to it in any configuration. This apparel benefits workers with higher visibility for low light conditions, however is not ANSI compliant. By following the guidelines established by ANSI/ISEA 107, organizations are providing workers with the highest available visibility in hazardous conditions and are doing everything they can to avoid work-related injuries.